Enver Creek Secondary’s senior robotics team (4549B) has been ranked first in the world for its programming skills. 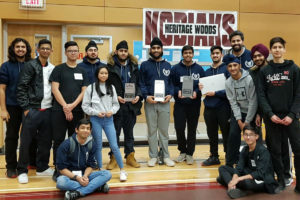 The team’s skills topped the 25-team field at the VEX Robotics Competition at Port Moody’s Heritage Woods Secondary Feb. 1, where they were also named tournament finalists and won the Inspire Award. Coached by teacher Reuben Heredia, Enver Creek’s 4549A team was fourth overall at “skills” and were named tournament semi-finalists, while team 4549D was a quarter-finalist at its second tournament ever. Enver Creek has a robotics program which consists of five teams of between three to five students. Anyone who would like to support the Enver Creek robotics team can attend the Enver Competition “and/or they can donate to the Enver Creek Robotics program using surrey schools’ online donation: surreyschools.schoolcashonline.com/Fee/Index. The fund destination would be “Enver Creek” and they should mention “Enver Creek Robotics” in the message,” said Heredia.